For the stage musical, see Little Miss Sunshine (musical). For other uses, see Little Miss Sunshine (disambiguation). Little Miss Sunshine was an overwhelming box office success, attaining $100.5 million. The film was nominated for 4 Academy Awards, including Best Picture, and won two: Best Original Screenplay for Michael Arndt and Best Supporting Actor for Alan Arkin. It also won the Independent Spirit Award for Best Feature and received numerous other accolades. Sheryl Hoover (Toni Collette) is an overworked mother of two living in Albuquerque, New Mexico. Her gay brother, Frank (Steve Carell), an unemployed scholar of Proust, is temporarily living at home with the family after having attempted suicide. Sheryl's husband Richard (Greg Kinnear) is a Type A personality striving to build a career as a motivational speaker and life coach. Dwayne (Paul Dano), Sheryl's son from a previous marriage, is a Nietzsche-reading teenager who has taken a vow of silence until he can accomplish his dream of becoming a test pilot. Richard's foul-mouthed father, Edwin (Alan Arkin), recently evicted from a retirement home for snorting heroin, lives with the family. 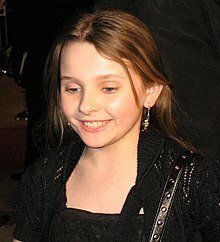 Olive (Abigail Breslin), the daughter of Richard and Sheryl and the youngest of the Hoover family, is an aspiring beauty queen who is coached by Edwin. Throughout the road trip, the family suffers numerous personal setbacks and discover their need for each other's support. Richard loses an important contract that would have jump-started his motivational business. Frank encounters the ex-boyfriend who, in leaving him for an academic rival, had prompted his suicide attempt. Edwin dies from a heroin overdose, resulting in the family smuggling the body out of a hospital and nearly having it discovered by the police. During the final leg of the trip, Dwayne discovers that he is color blind, which means he cannot become a pilot, a realization that prompts him to finally break his silence and shout his anger and disdain for his family. Olive calms him with a hug, and he immediately apologizes. The climax takes place at the beauty pageant. After a frantic race against the clock, the family arrives at the hotel, and are curtly told by a pageant organizer that they are a few minutes past the deadline. A sympathetic hired hand instead offers to register Olive on his own time. As Olive prepares for the pageant, the family sees Olive's competition: slim, hypersexualized pre-teen girls with teased hair and capped teeth, performing highly elaborate dance numbers with great panache. It quickly becomes apparent that Olive is an amateur by comparison. As Olive's turn to perform in the talent portion of the pageant draws near, Richard and Dwayne recognize that Olive is certain to be humiliated, and wanting to spare her feelings, run to the dressing room to talk her out of performing. Sheryl, however, insists that they "let Olive be Olive", and Olive goes on stage. Olive's hitherto-unrevealed dance that Edwin had choreographed for her is performed to Rick James' song "Super Freak". Olive scandalizes and horrifies most of the audience and pageant judges with a burlesque performance that she joyfully performs while oblivious to their reactions. The pageant organizers are enraged and demand Sheryl and Richard remove Olive from the stage. Instead of removing her, one by one the members of the Hoover family join Olive on stage, dancing alongside her to show their support. The family is next seen outside the hotel's security office where they are given their freedom on the condition that Olive never enters a beauty pageant in the state of California again. Piling into the van with the horn still honking, they happily smash through the barrier of the hotel's toll booth and begin their trip home to Albuquerque. You start off with all these people living their separate lives and the climax of the movie is them all jumping up onstage together. So the story is really about these families starting separately and ending together. When choosing the cast for the film, directors Jonathan Dayton and Valerie Faris were assisted by casting directors Kim Davis and Justine Baddeley who had worked with them on previous music videos. The directors had initially settled on Greg Kinnear to portray Richard Hoover. However, for the character of Sheryl Hoover, they considered several actresses before deciding on Australian actress Toni Collette. Davis and Baddely traveled to "every English-speaking country" to search for the actress to portray Olive Hoover, and they finally chose actress Abigail Breslin through an audition when she was six. Paul Dano was cast as Dwayne two years before production began and in preparation for portraying his character, spent a few days taking his own vow of silence. Alan Arkin, who portrayed Edwin Hoover, was initially considered too young for the role. The film was pitched to several studios, and the only interested studio was Focus Features, who wanted to film it in Canada. After the studio attempted to have the film be centered on the character Richard Hoover, and Arndt disagreed, he was fired and replaced by another writer. The new writer added several scenes, including Richard's confrontation with the character who dismisses his motivational technique business. A corporate change brought in a new studio head and Arndt was rehired when the new writer left after four weeks of rewriting the script. After two years of pre-production, Focus Features dropped the film in August 2004. Marc Turtletaub paid $400,000 to Focus Features to buy back the rights to the film and for development costs. He also paid for the $8 million budget, allowing Little Miss Sunshine to then be filmed. When writing the script, Arndt chose the Volkswagen T2 Microbus to use for the road trip based on his experience with the vehicle and its practicality for filming: "I remember thinking, it's a road trip, what vehicle are you going to put them in? And [the] VW bus just seems logical, just because you have these high ceilings and these clean sight lines where you can put the camera. In the front windshield looking back and seeing everybody." Five VW Microbuses were used for the family car as some were modified for different filming techniques. Three of the vans had engines, and the two without were mounted on trailers. During pre-production, the cinematographer used a basic video camera and set it up at angles inside the van to determine the best locations to shoot from during filming. 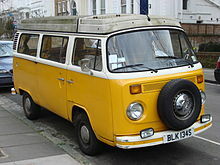 Many of the problems associated with the van that was included in the plot (a broken clutch, a stuck horn, and a detached door), were based on similar problems that writer Arndt experienced during a childhood trip that involved the same type of vehicle. While filming the scenes where the family pushes the van to get it started, a stunt coordinator was used to ensure the safety of the actors. In an interview, actor Greg Kinnear jokingly described how the scenes were filmed when he was driving: "I was going like 50 miles an hour in this '71 VW van that doesn't have side airbags. Basically, you'd wait for this huge camera truck to come whizzing in front of us with the camera. 'Okay, go!' I mean, it was insanity; it's the most dangerous movie I've ever made." While filming the scenes in the van, the actors would at times remain in the vehicle for three or four hours a day. For scenes in which Alan Arkin's character was swearing excessively, Breslin had her headphones on and could not hear the dialogue, just like her character in the film. Only when she saw the film did she know what was being said. On July 25, 2006 Fox Searchlight Pictures invited VW bus owners to a screening at Vineland Drive-In theater in Industry, California. Over 60 of the vans were present at the screening. Prior to writing the script, Arndt read in a newspaper about Arnold Schwarzenegger speaking to a group of high school students and saying "If there's one thing in this world I hate, it's losers. I despise them." As a result, Arndt developed his script lampooning the thought process: "And I thought there's something so wrong with that attitude ... I wanted to ... attack that idea that in life you're going up or you're going down ... So to a degree, a child beauty pageant is the epitome of the ultimate stupid meaningless competition people put themselves through." Co-director Jonathan Dayton also commented on the importance of the pageant to the film: "As far as the pageant goes, it was very important to us that the film not be about pageants. It's about being out of place, it's about not knowing where you're going to end up ..." All the girls acting as participants in the beauty pageant, except Abigail Breslin, were veterans of real beauty pageants. They looked the same and performed the same acts as they had in their real-life pageants. To prepare for filming, the directors attended several pageants in Southern California and met with a coordinator to learn more about the pageant process. A mother of a contestant in the film claimed that the film overplayed practices that the contestants go through: "Most pageants aren't quite like that, with shaving the girls' legs, spraying them with fake tans and putting on so much makeup." The film received critical acclaim. On Rotten Tomatoes, the film received a 91% positive aggregate rating, based on 211 reviews, with an average rating of 7.7/10. The site's critical consensus reads, "Little Miss Sunshine succeeds thanks to a strong ensemble cast that includes Greg Kinnear, Steve Carell, Toni Collette, Alan Arkin, and Abigail Breslin, as well as a delightfully funny script." On Metacritic, the film holds a score of 80 out of 100, based on reviews from 36 critics, indicating "generally favorable reviews." Owen Gleiberman of Entertainment Weekly labeled the film with a 'C' rating, calling the characters "walking, talking catalogs of screenwriter index-card data." 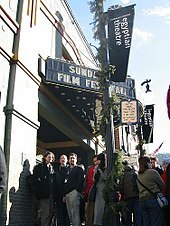 Jim Ridley of The Village Voice called the movie a "rickety vehicle that travels mostly downhill" and a "Sundance clunker." Liam Lacey of The Globe and Mail criticized the film, stating "Though Little Miss Sunshine is consistently contrived in its characters' too-cute misery, the conclusion, which is genuinely outrageous and uplifting, is almost worth the hype." Anna Nimouse of National Review wrote that the film "is praised as a 'feel-good' film, perhaps for moviegoers who like bamboo under their fingernails. If you are miserable, then Little Miss Sunshine is the film for you." Paste Magazine named it one of the 50 Best Movies of the Decade (2000–2009), ranking it at #34. On March 11, 2011 Malcolm Gets left the show. Ensemble member Andrew Samonsky took over the role of Uncle Frank, and understudy Ryan Wagner took over the role of Joshua Rose until the show closed on March 27, 2011. The musical premiered at Second Stage Theatre on October 15, 2013 (previews), and officially on November 14, 2013. The production closed on December 15, 2013. The cast features Hannah Rose Nordberg as Olive Hoover, Stephanie J. Block as Sheryl Hoover, Rory O'Malley as Frank Hoover, Wesley Taylor as Joshua Rose, Josh Lamon as Buddy, David Rasche as Grandpa Hoover, Jennifer Sanchez as Miss California and Logan Rowland as Dwayne Hoover. ^ a b c d e "Little Miss Sunshine". Box Office Mojo. Retrieved August 22, 2008. ^ Hornaday, Ann (July 30, 2006). "From Shadows to "Sunshine"". The Washington Post. Archived from the original on January 4, 2011. ^ Duong, Senh (January 21, 2006). "Sundance: Searchlight Spends Big For "Little Miss Sunshine"". Rotten Tomatoes. Archived from the original on November 22, 2007. ^ a b c d "Little Miss Sunshine: The Shooting Script". FORA.tv. February 15, 2007. Archived from the original on January 4, 2011. ^ a b c d e Gullién, Michael (July 20, 2006). "Little Miss Sunshine—Interview With Valerie Faris and Jonathan Dayton". Twitch. Archived from the original on January 4, 2011. ^ a b c d e f g h i j Balfour, Bradley (February 20, 2007). "Directors of New Surprise Hit 'Little Miss Sunshine' Under the Spotlight". The Epoch Times. Archived from the original on July 7, 2007. ^ a b c d e f Fox Searchlight Pictures. "About the Production" (PDF). el racó interactiu de cinema. Archived from the original (PDF) on January 6, 2011. ^ a b c d e f Waxman, Sharon (January 23, 2006). "A Small Film Nearly Left for Dead Has Its Day in the Sundance Rays". The New York Times. Archived from the original on January 6, 2011. ^ Rottenberg, Josh (August 3, 2006). "The Sunshine Band". Entertainment Weekly. Archived from the original on January 6, 2011. ^ Moore, Roger (August 16, 2006). "Directors keep their 'Sunshine' out of the Sunshine State". Orlando Sentinel. Archived from the original on January 6, 2011. ^ Arndt, Michael (February 6, 2007). Little Miss Sunshine: The Shooting Script. New York: Newmarket Press. p. x. ISBN 1-55704-770-7. ^ Little Miss Sunshine-(Commentary by Jonathan Dayton, Valerie Faris, and Michael Arndt) (DVD). 20th Century Fox. December 19, 2006. Event occurs at 11:33. ^ Press, Skip (2008). The Complete Idiot's Guide to Screenwriting (3rd ed.). New York: Penguin Group. p. 252. ISBN 1-59257-755-5. ^ a b c d Goldstein, Patrick (February 20, 2007). "The unkindest cut". Los Angeles Times. Archived from the original on February 22, 2007. ^ Little Miss Sunshine-(Commentary by Jonathan Dayton, Valerie Faris, and Michael Arndt) (DVD). 20th Century Fox. December 19, 2006. Event occurs at 46:30. ^ a b Guillén, Michael (February 23, 2007). "Michael Arndt, Little Mr. Sunshine". SF360. Archived from the original on March 8, 2007. ^ Bowles, Scott (August 27, 2006). "'Sunshine,' out of the shadows". USA Today. Archived from the original on January 6, 2011. Retrieved August 28, 2006. ^ Fleming, Michael (April 12, 2005). "Trio going on road trip". Variety. Archived from the original on January 6, 2011. ^ Little Miss Sunshine-(Commentary by Jonathan Dayton, Valerie Faris, and Michael Arndt) (DVD). 20th Century Fox. December 19, 2006. Event occurs at 1:35:41. ^ Bandler, Michael (January 29, 2006). ""Little Miss Sunshine", Sundance Festival Film, Shows Its Glorious Colors". NewsBlaze. Archived from the original on January 6, 2011. ^ "Family sues in death of girl who inspired 'Little Miss Sunshine'". Home News Tribune. Associated Press. April 3, 2007. Archived from the original (Fee required) on October 19, 2016. Retrieved January 6, 2011. ^ a b Little Miss Sunshine-(Commentary by Jonathan Dayton, Valerie Faris, and Michael Arndt) (DVD). 20th Century Fox. December 19, 2006. Event occurs at 23:10. ^ Little Miss Sunshine-(Commentary by Jonathan Dayton, Valerie Faris, and Michael Arndt) (DVD). 20th Century Fox. December 19, 2006. Event occurs at 31:22. ^ Little Miss Sunshine-(Commentary by Jonathan Dayton, Valerie Faris, and Michael Arndt) (DVD). 20th Century Fox. December 19, 2006. Event occurs at 1:01:51. ^ a b c d Chupnick, Steven (July 26, 2006). "Interview: Riding In The Little Yellow Van With Little Miss Sunshine". Movie Web. Archived from the original on January 6, 2011. ^ Aames, Ethan (July 19, 2006). "Interview: Alan Arkin and Abigail Breslin in "Little Miss Sunshine"". Cinema Confidential. Archived from the original on January 6, 2011. ^ "Little Miss Sunshine VW Drive in City of Industry, CA on July 25th". Fox Searchlight Pictures. Archived from the original on January 6, 2011. ^ Voynar, Kim (July 26, 2006). "Interview with 'Little Miss Sunshine' Directors Valerie Faris & Jonathan Dayton". eFilmCritic. Archived from the original on January 6, 2011. ^ a b c Smiley, Joanna (September 7, 2006). "Little Miss Vista". Today's Local News. Archived from the original on October 16, 2007. ^ Little Miss Sunshine-(Commentary by Jonathan Dayton, Valerie Faris, and Michael Arndt) (DVD). 20th Century Fox. December 19, 2006. Event occurs at 1:17:00. ^ Halbfinger, David (January 28, 2006). "Sundance Shines Light on Changes in Market". The New York Times. Archived from the original on January 6, 2011. ^ a b Mandelberger, Sandy (January 22, 2006). "First Major Acquisitions Deal Announced". FilmFestivals.com. Archived from the original on January 6, 2011. ^ Chatelin, Bruno (February 2, 2006). "Picking up hot numbers in Park City". FilmFestivals.com. Archived from the original on January 6, 2011. ^ a b c "Little Miss Sunshine Box Office Summary". Rotten Tomatoes. Archived from the original on August 3, 2008. ^ "Daily Box Office (July 28–30)". Box Office Mojo. Retrieved August 22, 2008. ^ Daily Box Office (July 24–27), (July 28–30), (July 31-August 3), (August 4–6), (August 7–10), (August 11–13), (August 14–17). Box Office Mojo. Retrieved August 22, 2008. ^ "Little Miss Sunshine-Foreign Box Office". Box Office Mojo. Retrieved August 22, 2008. ^ "Little Miss Sunshine (2006)". Rotten Tomatoes. Retrieved January 18, 2011. ^ "Little Miss Sunshine". Metacritic. Retrieved January 18, 2011. ^ Medved, Michael. "Little Miss Sunshine". MedvedMovieMinute. Archived from the original on November 14, 2007. ^ Siegel, Joel (July 27, 2006). "Forecast for 'Little Miss Sunshine': Oscar Heat". ABC News. Archived from the original on January 6, 2011. ^ Papamichael, Stella (September 5, 2006). "Little Miss Sunshine (2006)". BBC News. Archived from the original on January 6, 2011. ^ Puig, Claudia (December 21, 2006). "These kids are golden". USA Today. Archived from the original on January 6, 2011. ^ Gleiberman, Owen (July 26, 2006). "Movie Review: Little Miss Sunshine (2006)". Entertainment Weekly. Archived from the original on January 6, 2011. ^ Ridley, Jim (July 25, 2006). "Ain't No Sunshine". The Village Voice. Archived from the original on January 6, 2011. ^ Lacey, Liam (April 8, 2006). "Proust, Nietzsche and JonBenet". The Globe and Mail. Archived from the original on January 6, 2011. ^ Nimouse, Anna (February 26, 2007). "Little Miss Miserable". National Review. Archived from the original on January 6, 2011. ^ Emerson, Jim (August 4, 2006). "Little Miss Sunshine". RogerEbert.com. Archived from the original on January 6, 2011. ^ Tallerico, Brian. "Little Miss Sunshine (Fox Searchlight)". UGO.com. Archived from the original on January 6, 2011. ^ a b "Little Miss Sunshine — Weekly DVD Sales". The Numbers. Archived from the original on January 6, 2011. Retrieved June 6, 2014. ^ "Little Miss Sunshine DVD/Home Video". Box Office Mojo. Retrieved August 22, 2008. ^ Salas, Randy A. "Classic films line up for Blu-ray". Star Tribune. Archived from the original on January 6, 2011. ^ "79th Academy Awards". Academy of Motion Pictures Arts and Sciences. Archived from the original on January 13, 2008. ^ "AFI AWARDS 2006". American Film Institute. Archived from the original on January 6, 2011. ^ "Film Awards Winners in 2007". British Academy of Film and Television Arts. September 26, 2007. Archived from the original on January 6, 2011. ^ "The Little Miss Sunshine Awards List Keeps Growing". Fox Searchlight Pictures. Archived from the original on January 6, 2011. ^ "Little Miss Sunshine improves Oscar prospects with win at Screen Actors Guild awards". International Herald Tribune. Associated Press. January 29, 2007. Archived from the original on January 6, 2011. ^ "Little Miss Sunshine (2006) Awards". The New York Times. Archived from the original on January 6, 2011. ^ Keck, William (January 7, 2007). "Palm Springs Film Festival kicks off awards season". USA Today. Archived from the original on January 6, 2011. ^ "Michael Douglas in the spotlight at Deauville film fest". MSN. August 29, 2007. Archived from the original on December 31, 2007. ^ Hernandez, Eugene (February 24, 2007). "Sunshine Wins Four, Half Nelson Gets Two at Independent Spirit Awards; Quinceanera and Sweet Land Also Win Top Prizes". indieWire. Archived from the original on March 7, 2007. ^ "49th Annual Grammy Award Winners List". The Grammy Awards. Archived from the original on January 6, 2011. ^ "MTV announces nominees for movie awards". USA Today. Associated Press. May 1, 2007. Retrieved July 20, 2009. ^ "International Press Academy Satellite Awards Winners". The Golden Satellites. Archived from the original on May 1, 2008. ^ "Chicago Film Critics Association 2006". 2006 19th Chicago Film Critics Awards. Archived from the original on January 6, 2011. ^ "Babel scores big with 7 Golden Globe nods". CNN. Associated Press. December 14, 2006. Archived from the original on February 24, 2008. ^ a b c d Laporte, Nicole; McClintock, Pamela (February 17, 2007). "Credits flap darkens Sunshine". Variety. Archived from the original on January 6, 2011. ^ Cieply, Michael (June 14, 2007). "Oscar Rules Regarding Producing Are Relaxed". The New York Times. Archived from the original on January 6, 2011. ^ Goldstein, Patrick (February 27, 2007). "Academy rule riles producers". Los Angeles Times. Archived from the original on January 6, 2011. ^ Kilday, Gregg (January 27, 2007). "Oscars' rule of 3 cuts Grey, Berger, Yerxa". The Hollywood Reporter. Archived from the original on April 2, 2007. ^ a b McNary, Dave (December 14, 2007). "Academy bends on 'rule of three'". Variety. Archived from the original on January 6, 2011. ^ Sullivan, Jim (July 28, 2006). "DeVotchKa's music is as offbeat as its name". The Christian Science Monitor. Archived from the original on January 6, 2011. ^ a b Hoard, Christian (February 7, 2007). "Devotchka: The Best Little Grammy-Nominated Band You've Never Heard Of". Rolling Stone. Archived from the original on January 6, 2011. ^ "78th Academy Awards Rules". Academy of Motion Picture Arts and Sciences. Archived from the original on April 15, 2007. ^ "The 11th Annual Satellite Awards Nominees". International Press Academy. Archived from the original on January 6, 2011. ^ a b "Little Miss Sunshine Original Soundtrack". AllMusic. Retrieved August 22, 2008. ^ Greenblatt, Leah (August 4, 2006). "Track Stars". Entertainment Weekly. Archived from the original on January 6, 2011. ^ Toy, Sam. "Review of Little Miss Sunshine". Empire. Archived from the original on January 6, 2011. ^ Jarry, Johnathan (August 20, 2006). "SoundtrackNet: Little Miss Sunshine". SoundtrackNet. Archived from the original on January 6, 2011. 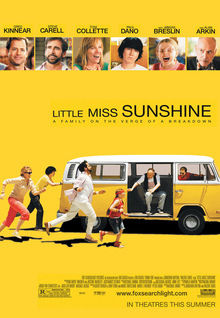 ^ "Little Miss Sunshine Original Soundtrack Billboard". AllMusic. Retrieved August 22, 2008. ^ "Little Miss Sunshine (2006)". Yahoo! Movies. Archived from the original on January 6, 2011. ^ a b Little Miss Sunshine-(Commentary by Jonathan Dayton, Valerie Faris, and Michael Arndt) (DVD). 20th Century Fox. December 19, 2006. Event occurs at 1:31:48. ^ "TWO ORIGINAL MUSICALS LIKE WATER FOR CHOCOLATE AND LITTLE MISS SUNSHINE, SELECTED FOR ANNUAL SUNDANCE INSTITUTE THEATRE LAB AT WHITE OAK OCTOBER 25 - NOVEMBER 8, 2009" (PDF) (Press release). Sundance Institute. September 22, 2009. Retrieved May 11, 2016. ^ "Little Miss Sunshine". La Jolla Playhouse. Archived from the original on January 6, 2011. ^ Hebert, James (December 17, 2010). "The "Sunshine" set: Playhouse announces new musical's cast". U-T San Diego. Archived from the original on January 6, 2011. ^ "Little Miss Sunshine - Off-Broadway Tickets". Broadway.com. Retrieved May 11, 2016. ^ "Little Miss Sunshine - Off-Broadway Cast". Broadway.com. Retrieved May 11, 2016.